I forgot to take my camera this year, because I'm an idiot. Still, I have one now and am able to take a photo of my haul. Wild West Exodus is a game that someone was clearly making a serious effort to promote this year. It seems to be a western-themed sci-fi skirmish game. The miniature came free with the event entry and the rulebook was also being given away free. It seems almost churlish to say that I'm not sure the game is for me, but I'll give the rulebook a read anyway. I'm excited about both the ships (left-centre), which are for 1:2400 scale Anglo-Dutch Wars games, and the huge pile of 6mm English Civil War figures to the bottom right of the picture. I did however get a little carried away there, and realised after purchasing it that the Montrose army isn't actually all that useful for the scenarios I'm planning to game. But it was available at a whopping discount and I am sure I will get some use out of it. I also made an error with the movement trays, since what I really need is 160x50 trays and those are 160x100s. Again, though, they will eventually come in handy when I get some warbands together, or for cavalry units. The two Foundry blisters and the Velites are the only 28mm figures I bought this year - I still have a sizeable backlog of Romans to work through and I didn't want things to pile up there even more. The slaves are for a diorama base for one of my existing generals, while the Thracian hill chieftains are a bit of an indulgence as I've had my eye on one of them for about a year and couldn't resist at show prices. The Clint Eastwood badge was from a game by Wigmore Warriors. Competing in minigames for each of the Man With No Name trilogy, the winner got the Clint badge. The first game was basically pontoon, the second a variation on Snap, and for the third we had to find a pin in a tin of spaghetti with chopsticks. I won two of three to claim the badge. I then moved on to a Gripping Beast demo game for the Swordpoint rules system. I took over command of a Roman army about halfway through a battle against Carthage and, really, it was a lost cause before I arrived. A unit of principes on my left flank had just been broken by an elephant, and while my reserve triarii were trying to come up to plug the gap, they just weren't fast enough. On the right flank, my cavalry were just about holding out against their Carthaginian counterparts with reinforcements on the way, and the hastati and principes were even pushing forwards. My left-flank reserve triarii managed to hold off a frontal elephant charge, but the damage was already done and the second elephant ploughed into the flank of a unit of hastati already engaged to the front, who never really had a chance - and then powered on into the principes beyond and broke them as well. With my whole centre gone, that was the end of that. Finally there was a 54mm skirmish game by Ad Hoc games in which four heroic characters attempted to liberate the Tsar and his family from captivity before they could be shot. The theme of this year was the Russian Revolution and there were a couple of games along these lines, as well as the free show miniature (roughly in the middle on the above picture) which is a female Red Guard. Representing the less neckbeardy side of the hobby, the Ad Hoc scenario was accompanied by some of the most groanworthy and laboured puns and theatricality imaginable, including a pantomime horse. I took command of a Red Army tank arriving to reinforce the guards, where my guess-range shooting terrorised the escaping dignitaries and surprised even me with its accuracy. Random scatter took its toll, though, and all the imperial family got away, along with their rescuers (although we did manage to kill their dog). My only real regret (other than not being much richer and thus able to afford many more things) is that I don't as yet have any rules for either the ECW troops or the ships, so I can't game with them yet (not that I've gamed with my Romans yet either, to be fair). 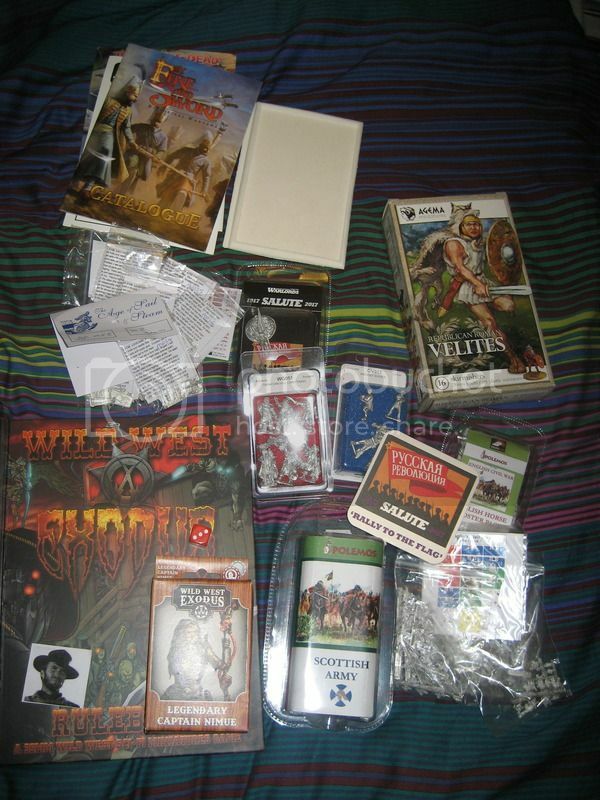 I had been planning to get the Warlord Pike and Shotte rules, as the Warlord family of rules are all geared towards my taste, but they are also fairly expensive (£30 for the basic rulebook and an additional ~£20 for the ECW -specific supplement) and the show deal where you get a free box of plastics was great for Hail Caesar last year but not so good this time as I'm going to game the period in 6mm not 28mm. But with those off the table, I wanted to do a little more research before taking the plunge on a ruleset I might end up finding excessively fiddly. Still, another good year, though I'm definitely getting older, since I found myself inwardly grumbling about the number of sci-fi stands compared to historicals. Ultimately, though, there was still plenty there to capture and retain my interest for six hours, as well as some great deals and the opportunity to talk to and you can't say fairer than that. Wild West Exodus is undergoing a revamp and relaunch, due in September. It's going to be sweeeeeeeet. I'm very proud to say that I have involvement in its development and I've seen just how passionate the guys at Warcradle Studios are about the game. I've played several demo games now and it's a really absorbing, fun little game that just invites narrative and connection with your little guys on the board. The beta test rules for 2E are available to download right now and while it's far from complete, it gives a pretty good feel to the direction the game is taking. I have to say it did look good on the table, and both the Wild West and fantasy are things I'm definitely interested in, but the sheer volume of background content in the rulebook and the extent to which that was necessary to make sense of the setting and the game was a bit overpowering for me considering I'm not sure it's something I want to get into anyway. If I remember rightly, I'm entitled to a free copy of the 2nd edition rules when they're released, since I own the first edition rulebook. If I haven't made any headway with it by then and/or have decided it isn't for me I would be happy to send my copy to someone who'd get more out of it. Part of the 2E revamp is making that background infinitely more cohesive.